The best welding boots are must-have items for all the serious welders, and being a weekend warrior, you should consider having such footwear too. These welding accessories should be on the list of priorities as they also offer the same degree of protection as other personal protection equipment (PPE) like helmets, jackets, and gloves. Welding boots are most important if you are performing overhead welding tasks because anything that might fall down could cause serious burns on whatever you are wearing. So, instead of ruining your feet or a nice pair of shoes, it is always best to cling on a good pair of welder boots to keep you safe in the long run. The Dr. Martens Ironbridge Met Guard Boot has an average customer rating of 4.3-Stars. These are steel toe welding boots with a metatarsal guard design, protecting your feet from scrapes, bumps, and other unforeseen hazards. The metatarsal guard, including the electrical hazard protection and the steel toe simply keep your feet away from harm’s way. Additionally, these welders boots feature a water-resistant design with full-grain leather uppers, which are double-stitched, resulting in long-term durability. The overall construction exceptionally keeps you safe on the work site. Further highlights include a removable padded insole that allows for comfort. There is also an exclusive air-cushioned sole that results in a non-slip security. On top of that, the outsole is rugged and made of durable trans PVC, while adding support through the ballistic mesh-padded ankle collar. You can find very durable metal eyelets, plus D-ring and premium cord lacing in these boots. For stability, these welding boots for men also feature standard wood shank. Each boot weighs at approximately 38 ounces, while retains the iconic yellow stitching. Surprisingly, this pair of boots also features a Cosmo moisture wicking lining like no other. Indeed, it is a pair of rugged-looking boots that can withstand the toughest wear. 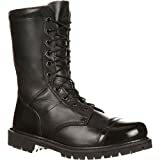 The Dr. Martens Ironbridge Met Guard Boot is the top solution for people with welding boots dilemma. It is not only suitable for the professional welders, but also for the beginners in the industry. The tough sole construction will surely prevent you against slipping on slippery surfaces and in other wet conditions where the presence of petrol and oil are inevitable. These Doc Marten steel toe boots are extremely durable and always ready to handle the harshest wear and tear conditions. Next up is the Timberland PRO Steel-Toe Boot with an average rating of 4.5-Stars on Amazon. These Timberland pro welding boots are said to have all-inclusive protection, which is simply necessary in the arsenal of any welder, whether a novice or a pro. These cool looking boots are made of lightweight and flexible materials, including a comfortable and breathable design. These work boots from Timberland have been engineered to meet, and even surpass the ASTM safety standards for metatarsal impact and compression resistance. Hence, this footwear ensures to surpass your standards and requirements too. Furthermore, these boots feature a waterproof leather construction, including an anti-microbial lining membrane, keeping your feet safe from any harmful microorganisms as you do your thing in the welding industry. On top of the welt construction, it also boasts Kevlar stitching on the toe, met shield, and welt that results in maximum durability. The overall style is inspired by comfort, while the closed-cell polyurethane foot bed is able to provide sturdy cushioning. On the other hand, the rubber outsole is slip-resistant, abrasion-resistant, and oil-resistant, in case your work place deals with the inevitable existence of oil, petrol and other greasy elements. These high top work boots also boast an external anatomical metatarsal protection, while it is hinged for comfort in case you need to be in the squat position. The asymmetrical shield design tends to follow the natural shape of your foot, allowing for the utmost comfort and perfect fit. All in all, the Timberland PRO Steel-Toe Boot is the best footwear made especially for welders like you, taking pride in serving and protecting you as what you do in your job. These waterproof, rubber-soled boots are stronger than any leather counterparts, boasting a heat-resistant property that other brands cannot match. Meanwhile, the Rocky Duty Modern Paraboot garners an average rating of 4.4-Stars from its customers. Unlike other welding shoes, this pair of footwear appears to be military combat boots that feature an unmatched comfort technology in its interior design. The overall construction is made of full-grain, waterproof, and polishable leather material. Hence, these unlined, lace-up boots also feature replaceable Goodyear welt construction as well as a round-heel profile. These welding work boots also feature a contoured EVA foot bed, while its lugged outsole provides a non-metallic stabilizer. There is a side zipper in every boot, allowing for a quick and easy on-off. Measuring at 10 inches tall, these work boots are considerably taller than most welding footwear around as they have been designed to protect not only the feet, but also the leg’s bottom portion, considering the potential hazards in any workshop. In spite the boot’s length, they are always easy to take on and off due to the side zippers. Besides the smart-looking design, these top rated work shoes are said to be the most convenient, durable, and most supportive choice of welding boots to date. Why not? It is simply because the full-grain, water-resistant leather construction gives this footwear the maximum resilience, strength and protection, similar to what all welders need during their long day of welding activities. Overall, the Rocky Duty Modern Paraboot never results in discomfort, despite long periods of welding with these boots on. These leather, rubber-soled welding boots have the reliable, cushioned EVA foot bed that naturally contours to the natural shape of the feet; thereby, fitting naturally and seamlessly for the most comfortable feeling ever. Finally, the Caterpillar Assault Work Boot receives a 4.6-Star rating. 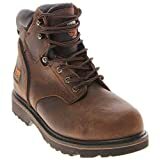 These Amazon Caterpillar boots have been designed, especially for men and are trusted by most welders today due to their durability and comfort. This CAT genuine leather footwear features a 6-inch lace-up shaft, while the metatarsal guard design tends to protect your feet against various kinds of impact. It also boasts a climasphere insole and lining, unlike any other brands of work boots on the market. There is a padded collar, resulting in added comfort, while reducing user fatigue, despite long periods of welding procedures. The single-stitched welt and round steel toe are among the features you will find in these welders work boots. Hence, the Caterpillar Assault prepares you for anything in the work site, delivering the necessary traction and grip that you need so as to get your job done on time. As soon as putting these boots on, you will instantly notice a big difference when it comes to feeling secure and supportive. The padded collar on top of each boot’s ankle provides an unmatched comfort, rather than of rubbing. Additionally, the metal lace-up makes you feel more secured, preventing them from slipping off your feet. The rubber sole design also helps in the slippage prevention, while providing excellent traction in wet and greasy conditions. Wearing these boots for long periods never means discomfort, because your feet remain not only comfortable, but also safe and protected. Hence, the metatarsal guard works very effectively in guarding your feet against impact, minor chemical spillage, heat and other unwanted elements in the job site. The overall leather construction of these welding boot covers is highly protective without any doubt, while increasing the levels of durability and comfort, despite an all-day welding session. After discussing the top safety shoes for welders, it is now time to talk about more important things, related to this footwear. As a potential buyer, you should keep in mind the following variables and factors as they can contribute to your buying decision later on. Thus, this section of the article will discuss the most important features that you must take note of when shopping for welding shoes or boots. Having an in-depth understanding of these factors will likewise help you in narrowing the available choices. The working environment of welders comes side by side with danger. So, finding the best protective gear is always a must. When choosing the best welder boots, there are basically three types of safety toes that you can choose from, ranging from the steel to the composite, and the aluminum. While all these variants are equally rated for ASTM protection, your personal taste and specific working environment push you to pick a particular type of safety toe design. Steel Toes – The best steel toe caps are the traditional choices for protection, and are considered as the heaviest and the most compact of all three types. Steel toe caps are highly capable of conducting temperature more than the alternative safety options.Today, manufacturers have started designing improved styles that offer comfort and fit of steel toes through protective toe caps to perfectly fit the boot size. It is wise to choose asymmetrical safety toes with toe and feet contours, and steel toe cap shoe that also reduces the bulk and weight, but still retains safety. Aluminum Toes – On the other hand, aluminum toes are lightweight options when it comes to protection. This particular type also meets ASTM/ANSI safety standards, although they are usually thicker than the previous type. Nonetheless, aluminum toes are great options for people who want the most lightweight variety in welding footwear. Composite Toes – The best composite toe shoes are usually comprised of Kevlar, plastic or carbon fiber and also complies with ASTM/ANSI safety standards. These types are lighter than the steel toes and considered as the thickest option. Thereby, composite toes have bulkier silhouettes.These types are incapable of transferring heat or cold because they are non-metallic, while providing an excellent safety option for people in metal-free environments. When shopping for good work boots, it is crucial to pay extra attention to the metatarsal guard design. This particular feature helps in the protection of the toe and upper foot areas against heavy falling objects. It is an added protection that is greatly beneficial to welders, including other employees who are exposed to working environments with hot materials, falling embers, and other related risks. Moreover, the sole of any welding boot or shoe plays a crucial role throughout its overall design. Nowadays, most manufacturers are able to create and make use of materials that make the outsoles more durable and long-wearing, despite heavy use and abuse. Many outsole designs are also slip-resistant. However, some industrial environments require a certain material, considering the specific work demands and hazards in such job sites. So, a better understanding of your options is always essential, before placing your order online. Rubber – Rubber outsoles are the most common components in the toughest boots for welders. This type of sole is usually abrasion-resistant, oil-resistant, and slip-resistant. Boots with rubber outsoles are perfect in construction job sites as well as in manufacturing settings.When opting for rubber outsoles, it is important to ensure that the design offers optimal traction on both dry and wet surfaces. Hence, today’s manufacturers have their exclusive proprietary rubber outsoles for added safety and performance. TPU – Also known as Thermo Polyurethane, TPU outsoles are typically constructed from oil-resistant, chemical-resistant, and abrasion-resistant materials.They are also long-wearing than ordinary counterparts. TPU outsole are said to be tough, while resisting splitting at the same time. They are more lightweight options, compared to the rubber outsoles. EVA Midsole – Meanwhile, the midsole of a work boot is engineered to distribute weight or to provide foot stability. The Ethylene Vinyl Acetate (EVA) midsole is a foam-like component, lightweight and flexible. A boot with EVA midsole is highly capable of cushioning the foot in every step. With very tight shoes, your feet may end up sore with abrasions and blisters. And with the improper footwear, you can suffer from different foot ailments like blisters, in-grown, corns, and worse. But, having the best work boots brand and perfect fit diminishes all these discomforts. At some point, leather boots will stretch, conforming to your foot’s shape over time. It is important to find the perfect size of work boots, maximizing not only the protective properties of such footwear, but also the all-day comfort that you need as you get your job done. Nowadays, many manufacturers and brands tend to offer wide and regular widths. Hence, identifying your specific foot size is equally crucial throughout the process, allowing you to determine the correct size of work boots for a perfect fit. The best work boots should always offer protection. And there are remarkable manufacturers that create highly-protective work boots, taking safety to the next level. Aside from making use of leather materials, different manufacturers are combining more durable elements in their designs, providing added protection not only to the foot, but also to the upper leg area. For instance, Kevlar fibers and stitching are integrated into their designs as these components have excellent fire-resistance capabilities. Most brands tend to include Kevlar thread in the overall construction of their work boots, providing a more protective welding and firefighting wear that will never melt, despite the amount of applied heat. Therefore, as a potential buyer of the best safety boots, taking note of the Kevlar stitching and other designs that contribute to the protective ability of such footwear is equally essential throughout your decision-making process. Over and above, the most durable work shoes for welders have been presented in this article, giving you no less than the top-rated choices of welding boots that professional welders highly prefer. Nevertheless, the experienced welders highly recommend using leather boots or shoes with an ankle coverage of between six and eight inches, allowing for the best foot and leg protection. Choosing models with metatarsal guards are also preferred over shoe laces because the former can offer better protection from sparks and falling objects, especially when performing overhead welding tasks. All in all, protective footwear is essential throughout workplaces, specifically in the manufacturing and industrial environments. Keep in mind that wearing good quality work shoes is equivalent to utmost protection, but also take note of the stability and traction that such footwear offers. Choosing at least one of the top rated mens work boots on the list will likewise increase your productivity, while on-site and costly injuries are eliminated as well. Check out other Welding Equipment too! TopWelders.com is a participant in the Amazon Services LLC Associates Program, an affiliate advertising program designed to provide a means for sites to earn advertising fees by advertising and linking to Amazon.com. Amazon, the Amazon logo, AmazonSupply, and the AmazonSupply logo are trademarks of Amazon.com, Inc. or its affiliates.